I told you all I’d check when about harvesting when I wrote about Growing Luffa Sponges a while back. I’ve begun to harvest my luffa sponges and it’s been a bit of a confusing endeavor. I read so many “How-To” articles and felt they were pretty misleading in ways. 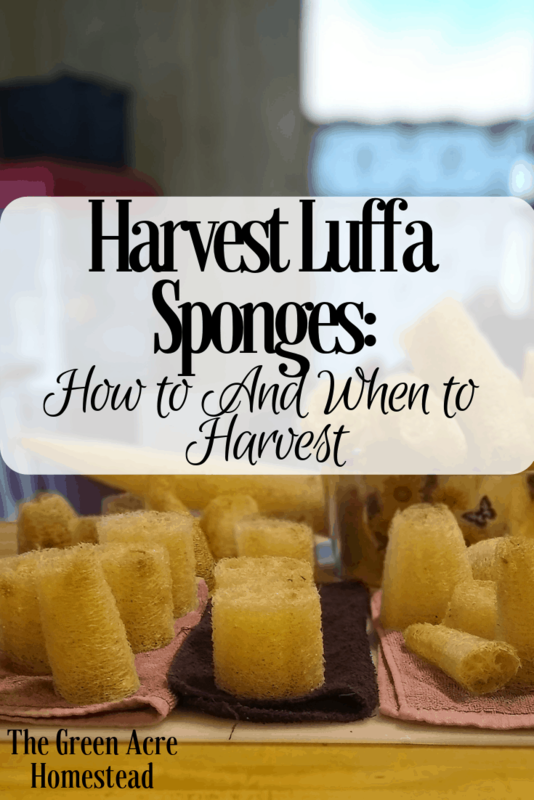 I’m going to explain to you what I’ve learned about harvesting luffa sponges and how I did it; what worked for me and what did not. You can’t go by color alone when it comes to harvesting your luffa sponges and that is slightly aggravating. You’ll read to only pick your luffas when they’re brown and dried on the vine. You’ll also read to only pick them when they’re still yellow/green. In my experience, you do not want them dried up and hard hanging on the vine. This means your luffa sponge is more likely to already be molding. 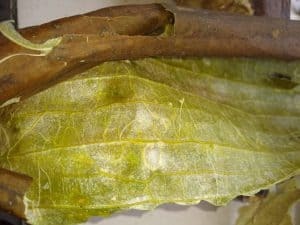 Instead, look for luffa gourds that are turning from green to yellow, making their way to a brown luffa. Harvest your luffa sponges before they have completely dried out, with a slight “give” when you squeeze it. If the gourd feels pretty soft, leave it a day and check again tomorrow. Pick the luffa if your luffa sponge feels like it’d be pretty hard if you waited a day! The browner your gourds get the harder they will get. I read this was the perfect time to pick them. As mentioned before, this method always meant more mold in my sub-tropical climate. The confusing part comes when I tell you the very first luffa sponge I ever harvested was rock hard. It sounded like a maraca when I shook it from the seeds; this luffa revealed no mold when peeled! For the rest of the luffas I waited to peel, this HAS NOT been the case. Molded luffa sponges that completely dried on the vine. After harvesting your luffas sponges using a pair of pruners, you’re ready to peel them! First, you’ll want to hit the gourd on a hard surface a few times to loosen the seeds. Next, cut the bottom end of the luffa sponge off. To be clear, this is the end that was not attached to the vine. If your gourd is extremely dry and sounds like a rattle, the seeds will probably fall out quite easily. My luffa sponges needed to be harvested a little sooner than that so it was a little more difficult to get the seeds out when peeling them immediately. Grab some scissors, cut down the inside of the luffa flesh and peel the skin all the way off! When harvesting your luffa sponges they’ll be much harder to peel if you wait until they’re completely dried on the vine. This is what the skin from a very dry luffa sponge looks like. 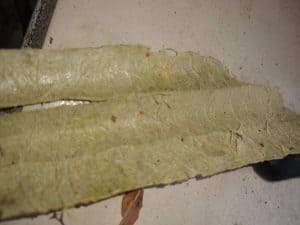 This is the internal skin of a luffa perfectly ready for harvest. Still with some moisture and easy to peel! After you’ve removed all of your seeds and peeled your luffa sponge rinse all the sap off the sponge itself. The easiest way to do this is to get a garden house with a sprayer and use the “pressure wash” setting, or something close to it. You’re looking for a straight stream of water that comes out with high pressure. Spray your sponge up and down until the slimy feeling has gone away. There’s no reason to be super persnickety doing this because you’re going to use your sponge in the water later anyway but just get as much out as you can. You’re also removing any extra dirt or plant particles while spraying the gourd. 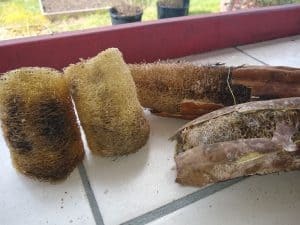 After your dry your luffa sponge you’ve successfully harvested your luffa sponges! I laid out a couple of towels on my kitchen counter, put my luffas on top of them and patted them down with another towel. Over a day or two, rotate your sponges and pat/squeeze them dry (be gentle). Once they’re completely dry, they’re ready to use! 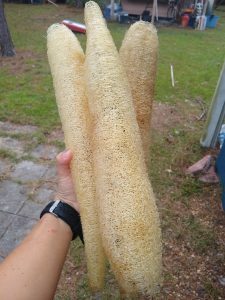 Have you grown and harvested luffa sponges before? How did it go and what was your method? What’ve you used your luffas for? It’s so interesting how the processes change in with each different climate, I’d love to hear about your experience in the comments below! 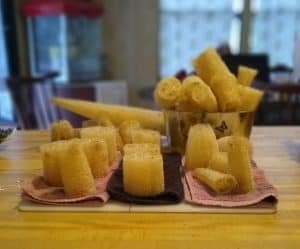 Read the post that inspired me to grow luffa sponges, to begin with, called “The Ultimate Guide to Successfully Growing Luffa Sponges“! Although luffas are summer crops, it’s never a bad time to learn how to “Prepare Your Homestead for the Spring Season“! Previous Post: « Simple Homestead Blog Hop #183 | Happy Thanksgiving! I believe I harvested around 20. This year was trial and error for me so I did lose some due to rotting. I’m still using the same one from last year on my dishes! They last an extremely long time, much longer than a standard sponge. I’m looking forward to hearing about your progress! Thank you for reading, Melody! I’ve never heard of this, thanks for the info! Thanks for sharing at the To Grandma’s House We Go DIY, Crafts, Recipes and More Link Party. I pinned this! Hope to have you join again this week. They’re great fun to grow! Thanks for stopping by, Sheri! Thanks for sharing on the Simple Homestead blog hop! Oh, of course! I’m blessed to be part of this hop every week. Thanks for stopping by, Rachel! This is something I want to try growing this summer. Saving this for sure. Found you on Simple Homestead Blog Hop. I have had so much fun growing luffa sponges and think everyone should do it once in their life if they have the room!